Russian media has threatened the United States with a 100 megaton nuclear weapon after a key arms treaty failed. 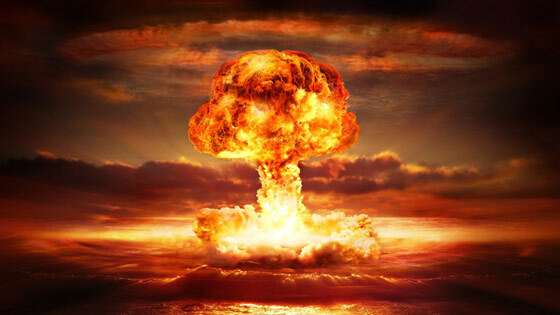 The doomsday device was a threat lobbed by Russian state-sponsored media and the Russian military after the U.S. announced that the country will exit the Intermediate Nuclear Forces treaties. Although treaties don’t mean much (their success hinges only on tyrants’ willingness to follow them and obey the words inked on paper anyway) the U.S. mainstream media seems to be afraid. According to MSN, the treaty was the only thing standing between Russia and another Cold War. It was “one of the last barriers to a full-on Cold War-like arms race in Europe – and there’s already talk of a nuclear doomsday device visiting the U.S.,” wrote MSN. The treaty was useless, however, as Russia disobeyed it. The INF treaty banned land-based nuclear-capable missiles with a range between 300 and 3,200 miles in 1987 when Russia and the U.S. had populated much of Europe with intermediate-range nuclear missiles. “The ban eliminated this entire class of missiles and went down as one of the most successful acts of arms control ever,” wrote MSN. Except it wasn’t successful in the least because Russian spent years developing a nuclear-capable weapon banned by the treaty, making the treaty absolutely worthless. The U.S. then responded by saying it would withdraw and design its own treaty-busting missiles. But the World War 3 and doomsday rhetoric jumped up a few notches when Russian media threatened to nuke the U.S. A BBC review of Russian newspapers, some state-owned and all adhering to state narratives or censored by the Kremlin, revealed some truly apocalyptic ideas. For those who missed it, a preemptive strike is sending a nuke over without provocation or at just a sign that there might be conflict. The arms expert also declared that with the INF officially dead, the U.S. and Russian will have to consider nuking each other first (preemptive strike) because missile attacks won’t be as predictable as longer-range salvos from the continental U.S. and Russia’s mainland. Russian media threatened to use a doomsday device that would trigger a devastating tsunami causing widespread death and destruction to coastlines. “It cannot be excluded that one of the Poseidon with a 100 megaton nuclear warhead will lay low off the U.S. coast, becoming ‘the doomsday weapon.‘ Thus an attack on Russia will become a suicidal misadventure,” the paper states.